Article - Ireland: Are leprechauns extinct? Can you still find leprechauns in Ireland? You need to count your fingers after shaking hands with a real leprechaun. I was in Ireland for five days in April and tried to find one while I was there. I started in Dublin. I wanted to find somewhere that had a lot of history, but a bit of mystique as well. 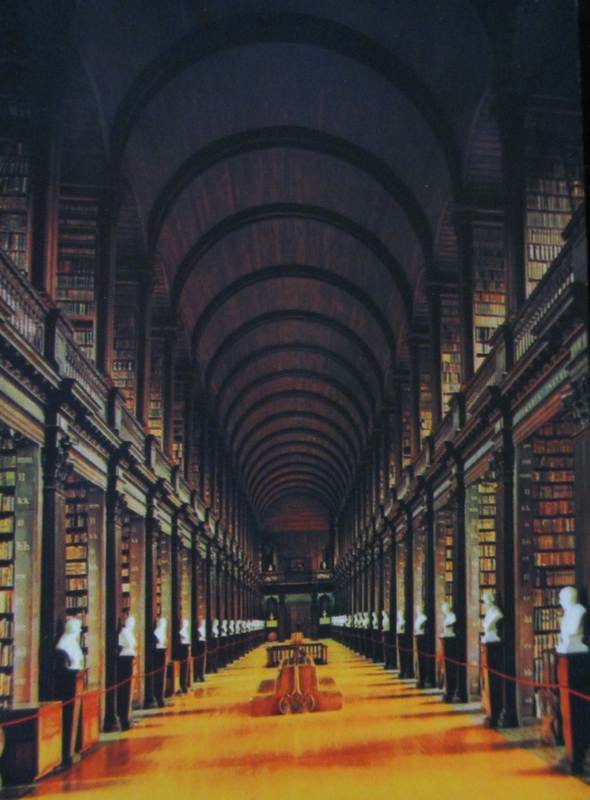 The Trinity College Library seemed a likely spot. There was an exhibition featuring ancient manuscripts called ‘Turning Darkness into Light’. It was interesting and didn’t overload on information. 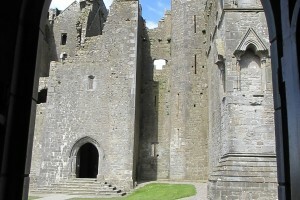 There were four manuscripts on display, two volumes of the Book of Kells, the Book of Amagh, and the Book of Durrow. The Book of Kells was written approximately 1500 years ago on the island of Iona, surely an ideal location for leprechauns. Although the text was so perfect and neat, and the illustrations intricate and delicate, that it was difficult to believe that it was written by ordinary human beings so long ago, but there was no reference to leprechaun involvement. The exhibition leads into the Long Room the main chamber of the Old Library. 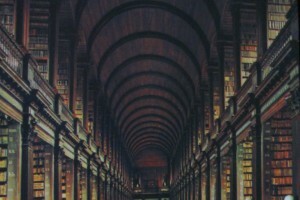 It’s nearly 65 metres in length and filled with 200,000 old books. I knew immediately no leprechaun there. The atmosphere was too somber and erudite, and I got the impression that most of these tomes were serious. Nonetheless, I checked all the marble busts that lined the alcoves. There were many philosophers and writers, but no leprechauns. That evening we dined with relatives in a fine Georgian townhouse in the centre of Dublin. There have been so many immigrants from Ireland that I think everyone in the world has relatives in Ireland. My husband, M, was no exception and we met with 18 relatives for dinner. Irish people are very aware of those who inhabit the ‘other world’ and the conversation included casual references to ghosts, but no confirmed sightings of leprechauns. The next day we headed out to Cobh (pronounced Cove) in County Cork. 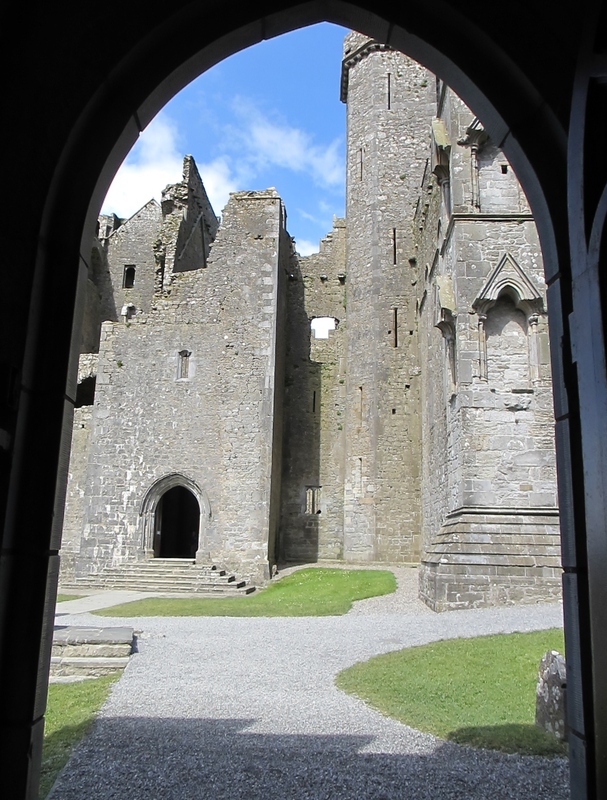 We made a slight detour off the highway to see the Rock of Cashel. This was the traditional seat of the Kings of Munster for hundreds of years before one of them converted to Christianity in the 5th century. I found gargoyle faces and medieval murals, but no leprechauns. There are many theories about the round tower approximately 28 metres tall, and I was hopeful it had been a leprechaun refuge. But again lots of references to ghosts, but only silence in regard to leprechauns. We continued on our way to Cobh. We had booked into Knockeven House, ‘luxury accommodation’. It had been M’s family home many years ago and he had spent a magical year there as an 8 year old. He assured me that he had met several leprechauns in the garden and had even locked one up in his tree house! Needless to say, although the house was as he remembered and we really enjoyed our stay, there was no sign of leprechauns. I hadn’t given up and we headed off in our hire car to explore the coast line. We drove west keeping as much to the coast line as we could all the way to Baltimore. We saw picturesque villages, boats, harbours and river inlets, but not a glimpse of a leprechaun. 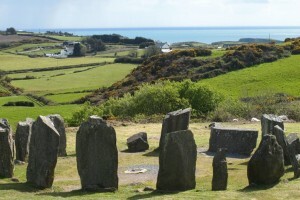 I was glad that I insisted on a detour to the Drombeg Stone Circle, a druid’s altar. The centre altar stone might have had leprechaun blood on it. 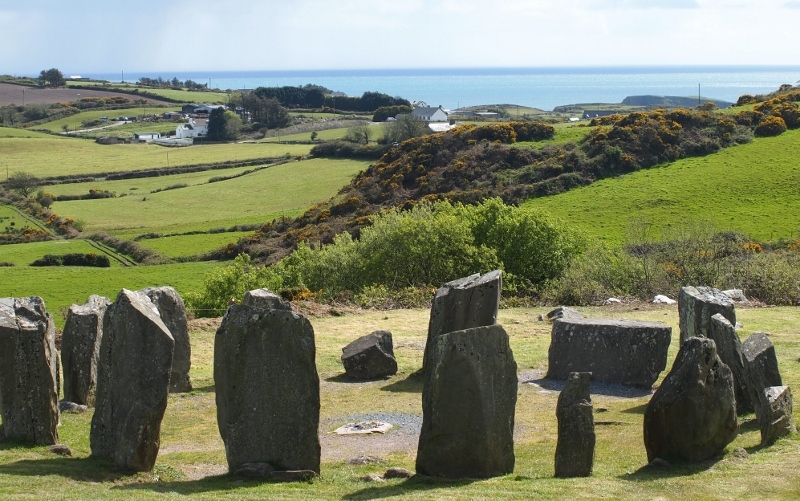 It was possible that the prehistoric huts in the vicinity could have been leprechaun hide-outs and perhaps the stone circle was built to commemorate their sacrifice! But then again, maybe not! The next day we headed off further west again taking an inland route to Killarney, another picturesque tidy town. The houses looked freshly painted, the pavements looked freshly cleaned, and only the people looked worn. Many of the people, in particular the men, looked as though they had worked outside for most of their lives. Their faces were battered and creased. Just outside of Killarney, we stopped at Muckross House and there, finally, I met a leprechaun. His name was Jerry and he was disguised as a jaunting car driver. Anywhere else a jaunting car would be called a horse and trap. 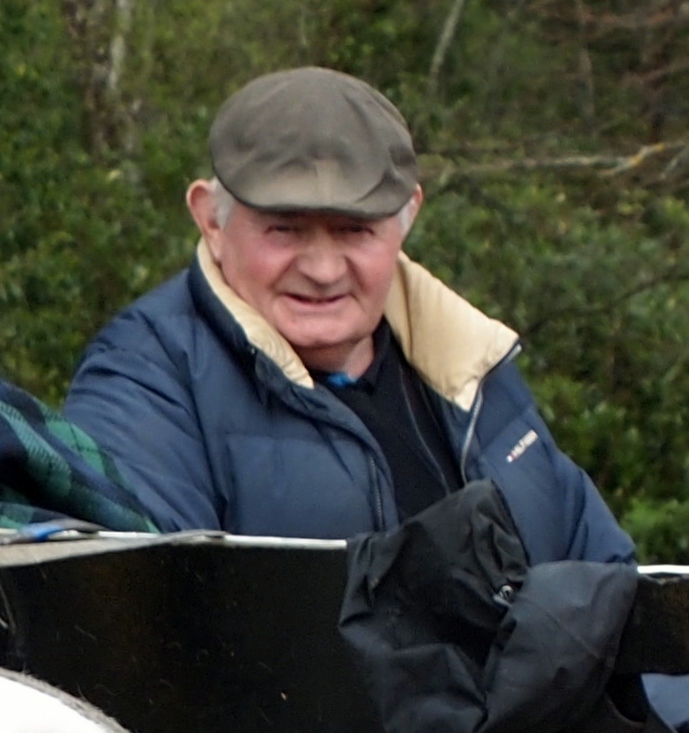 He approached M and I as soon as we parked our car, with the promise of a mystical tour of Killarney Park and the Muckross House gardens. Although it was cold, Jerry assured us that in his car, we would be as warm as toast, warm like toast, toast, very warm. Jerry repeated every sentence at least twice. He was hopeful, very hopeful, of sightings of leprechauns, but would only guarantee this if we consumed copious amounts of Guinness. 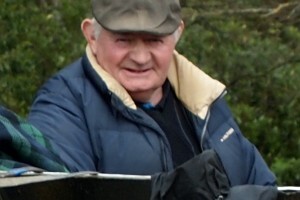 Fred, his 9 year old horse, could have taken us around the grounds without a driver. Jerry, the leprechaun, whose father and grandfather had been trap drivers, showed us a leprechaun bridge, and the boathouse where leprechauns could be held until they granted three wishes. And at the end of the ride, we gave Jerry all of our gold without a murmur. It was only later as the spell wore off, that we realized that we had been grossly overcharged! In fact double the going rate! But we didn’t mind, Jerry had entertained us. This was my first visit to Ireland and it was more than I had ever imagined. It was a good mix of history, scenic countryside and welcoming people, and I hope to return to spend more time discovering its beauty. Sometimes the line between past and present blurs, yesterday feels like today and it is possible to believe that you are living in the pages of the Old Testament. This was my experience, high on a mountain in northern Ethiopia. It’s over 2,000 years since the Ethiopian Orthodox Church was founded, but many of its traditions have remained unchanged. There are more than 12,000 churches of differing shapes and sizes throughout Ethiopia. But our small group of travelers was headed for two remote churches near the town of Hawzen in Tigrai. Our bus dropped us off at the bottom of a mountain. This wasn’t gentle undulating countryside. There were huge cliffs, ridges and tors bursting up out of the ground. We started to climb, clambering over rocks and scrambling up a narrow gully. It didn’t seem that difficult so our confidence grew. We had lots of helpers: the hired guides plus a crew of children who appeared from nowhere. Some were meant to be tending goats and donkeys, but they refused to return to such ordinary tasks whilst there were the foreigners to check out! We reached the top of the gully to be greeted by another fantastic view - and a sheer rock face! We stared at the cliff in dismay. There didn’t seem to be any hand or foot holds. However, there was lots of advice from both official and unofficial guides! I can’t remember the detail of that climb, but I can clearly recall the sense of exhilaration as I high-fived my guide at the top! We had a well-earnt rest in the shade of a small cave blackened with smoke, a shelter for shepherds and travelers. Here, some of the group reluctantly decided that they had had enough. That left four determined to continue. Up the mountain side we continued, pausing every now and again to catch our breath and gaze, awestruck at the view. Ethiopians believe that the Garden of Eden was located in their country, and I had no difficulty believing it to be somewhere nearby. The vistas stretched for miles and miles to a distant shimmering blue horizon. The rest of the track was a steady climb, some parts were difficult because of loose stones and gravel, at other times the path was so narrow that you had to watch every step. Then around a bend and finally ahead, there was our goal! The first church, clinging to the rock face: Mariam Kokore. Built in approximately 600AD, Mariam is one of the largest and most complex rock cave churches in Ethiopia. The facade of the church appears to be a later addition, whereas inside was clearly a hollowed-out cave. We stumbled over the uneven rock floor using our torches to peer at the intricately carved columns, arches of rock, and ancient painted murals. Daniel Kokore, the second church, was a further careful walk along a narrow ledge. This was an even older church. We squeezed through a narrow doorway to see more ancient murals. The tiny church could barely hold the four of us. As remote and isolated as these churches are, they have been in continuous use since the day they were built, if built is the right word. They chose the location over 1,500 years ago to ensure isolation, so I was concerned that we were unwelcome intrusions. These priests wanted to focus on their faith without distraction. Surely tourists would be unwelcome. Luckily the priest wasn’t at home, being away on church business. About halfway down the mountainside, we did meet him on his way back. We clasped hands and exchanged greetings. Salem, peace be with you. He had an air of tranquility, and far from resenting our presence, appeared genuinely pleased to see us. We didn’t have a common language, but there was no mistaking his gratitude for our small contribution towards the upkeep of the church. I felt humbled in the presence of this man, someone who was not interested in material wealth, but sought spiritual gold. A humble man, content to be living in solitude, close to his God, seeking enlightment in a stunningly beautiful part of the world. Has the Ark of the Covenant survived thousands of years? Does it rest in a church in Axum Ethiopia? The Ethiopians believe so. The son of King Solomon and the Queen of Sheba, Emperor Manikil of Ethiopia, stole the Ark from his father after their first meeting! King Solomon forgave the theft and made a gift of the Ark, healing the rift between father and son. And the Ark remained in Ethiopia ever since. Ethiopia is the most populous, landlocked nation in the world and the oldest known site recording human existence. It was the first major empire to convert to Christianity, and religion continues to play an important role in the daily lives of Ethiopians. Every one of the thousands of churches spread throughout Ethiopia has a tabot, a replica of the Ark of the Covenant, the sacred container for the Ten Commandments. The existence of the Ark is celebrated each year as part of the Timkat Festival. In January 2012 I was fortunate enough to witness this epiphany celebration. We were in Gonder, a city of ancient palaces. Our guide had found us a viewing point on a hotel balcony. Up four flights of steep steps, it was an excellent stakeout, but just too removed from the real action! Two of us left the tour group and headed back into the fray. It was early, but the town was already buzzing with excitement. We made our way through the crowds, weaving and side stepping, trying to find another vantage point. We headed for the town square which had broad steps on one side leading to a hotel. We found the steps already packed with tourists, but somehow we managed to wedge ourselves in. We had a splendid view: straight across the square and down the main street! Everyone was dressed in their Sunday best. The sun seemed even more dazzling as it reflected off spotless white dresses and robes. There was dust, there was noise, there was heat, and it was so exciting! A plane circled overhead, around and around, disgorging pamphlets and reeds. Catching one of these heavenly gifts guaranteed good luck for the following year. The procession was starting! We could see it coming down the main street. Groups of young men led the way, chanting, stamping and flourishing sticks. Very warrior-like, but I felt safe on the steps. Gleaming horses followed embellished with tassels and pom‑poms. Large floats trundled along, a castle and a church, decorated with enormous crosses and religious paintings. Choirs flowed past in waves of red, yellow and green, the national colors of Ethiopia. We were overwhelmed by music as everyone joined in singing hymns, swaying and clapping. Then the highlight, the church clergy: priests, deacons and bishops. They were dressed in richly colored ceremonial robes, bearing large processional crosses of gold and silver. Some had bright sparkling parasols. Others had square canopies balanced over their heads covered with rich materials. Only later did we realize that these square canopies were tabots, the replica Arks of the Covenant. Then more choirs, more singing, and more dancing. But the end of the procession was in sight, and it was time to move. We decided to join the flow of happy spectators on their way to the baptism pool. Once again, we weaved our way through the crowd following the procession. The people were relaxed, but tightly packed. We found it difficult to make our way, so chose gaps wherever we could whilst concentrating on staying together. Suddenly, somehow, we had joined the procession! We were on the wrong side of the barrier, separated from the spectators! Embarrassed, I apologized profusely to all around me. But as there was nowhere else to go, the only polite option was to join in. I tried to hide the fact that I couldn’t sing by smiling broadly, clapping loudly and dancing vigorously. I like to think my efforts were appreciated! Finally, exhausted, we threaded our way to the other side of the road, leaving the procession and meeting up with the other members of our group. We were all hot, tired and dusty, but exhilarated from our religious experience! Sue Wombat. Simple theme. Powered by Blogger.